Is Amish quilting static, or does it change? Amish women Mary Stoltzfus Lapp and Hannah Stoltzfoos were separated by a generation or two, but each contributed her own special innovation to Amish quilting. Quilt historian Janneken Smucker shares what those innovations were below–plus the unusual example of an Illinois Amish family who created their own “wild, individual” style. We know of lots of examples of innovating Amish individuals, who retrofit machinery to run on 9-volt batteries or air pumps. But what about quiltmakers? Do they innovate too? Indeed they do. Amish quiltmaking itself was an act of innovation, since it was more than 100 years after the first Amish began settling in North America that the first Amish began making quilts. Someone, somewhere, decided to innovate by covering a bed with a quilt rather than using the traditional German-style bedding of a straw-stuffed mattress, a feather tick, and woven coverlet. Since then, Amish quiltmakers have continued to innovate. Any time an individual decides to try out a new pattern, or adapt an existing one, we see an act of innovation. For example, Mary Stoltzfus Lapp (1875-1955), of Lancaster County, Pennsylvania, decided to make a Baskets quilt, a pattern unknown in her community where Sunshine and Shadows and Center Diamonds dominated. This pattern was not unusual in other settlements in the Midwest, but in Lancaster County, it stood out. And as a result, friends and neighbors commissioned Mary to make quilt tops in this pattern, or asked to borrow it to make their own. Baskets, unidentified Amish maker in the style of Mary Stoltzfus Lapp, c. 1920, Lancaster Co., Pennsylvania. International Quilt Study Center & Museum, University of Nebraska-Lincoln. Other Amish settlements have also been home to particularly innovative quiltmakers who have created imaginative, one-of-a-kind quilts. A handful of quilts attributed to various members of an extended family in Arthur, Illinois, attest to an innovative approach to quiltmaking, in which both commercially pieced and conventionally used patterns are set aside in favor of wild, individual quilts. It’s almost as if these women competed with one another to make the most distinct, innovative quilt, while other families preferred to use the same patterns over and over. Anna Swartzentruber Yoder, c. 1930, Arthur, Illinois, one of an extended family of innovative quiltmakers. Illinois State Museum. Selling quilts was also innovative. The first Amish quilt business was likely Hannah’s Quilts in Lancaster County in 1972. 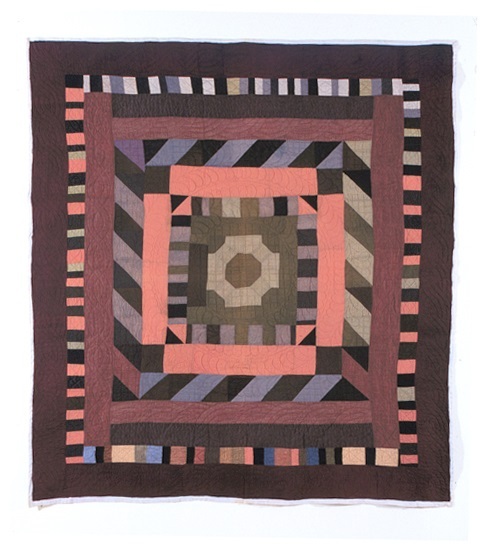 That year, Hannah Stoltzfoos sold twenty new quilts on consignment. In 1976, she sold 500! 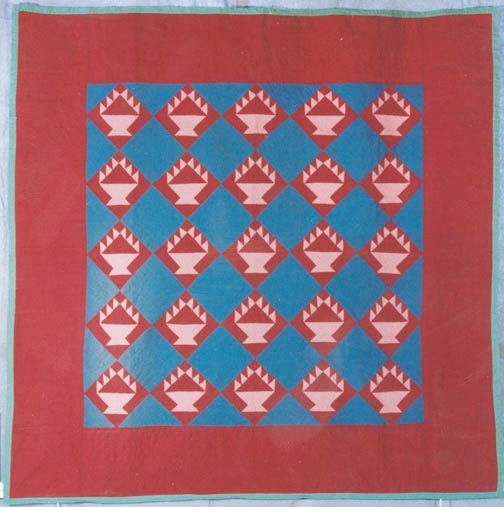 Outsider interest in quilts coincided with an entrepreneurial spirit in many Amish communities, so Stoltzfoos, along with many other businesswomen, capitalized on quilt mania in the 1970s and started successful businesses, taking an innovative approach to quiltmaking by employing quilters as contract workers who contributed various parts of the quiltmaking process. 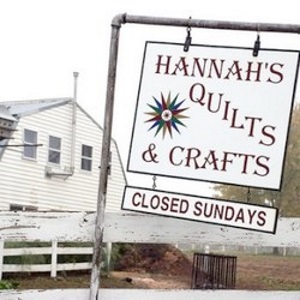 Hannah’s Quilts, the oldest Amish quilt shop in Lancaster County, Pennsylvania (Emma Witmer, an Old Order Mennonite woman, opened a shop even earlier, but alas, she is technically not Amish). Amish quiltmaking has never been static. It frequently has changed, often due to innovators like Mary Lapp and Hannah Stoltzfoos who were willing to try something new. Janneken Smucker is Assistant Professor of History at West Chester University, consulting curator for the International Quilt Study Center & Museum at the University of Nebraska-Lincoln, and author of multiple publications on quilts and quilting including Amish Quilts: Crafting an American Icon. I have seen some very beautiful Amish Quilts while in Berlin, Ohio and also in Jamesport, MO. Would love to own one sometime in the future. Beware. Not all advertised Amish Quilts are Amish made. Most are pricey so you do not want to end up with a quilt made in a factory. How can you tell for sure if they are really Amish made or not? Where in Lancaster is Hannah’s located? Are all the quilts there handmade by the Amish? I am coming out there this Summer and looking for some place to buy a true Amish quilt. On your second question, if it is important to you, you may want to ask if all the work is done by the Amish, as some Amish quilt makers/sellers have farmed out parts of the process to non-Amish, though I don’t know how prevalent that is now (Janneken may be able to tell you better). I have several friends and neighbors all of whom design and create Authentic Amish Quilts….because they are Amish. I live in Lancaster, perhaps we can meet up and go to view some Amish Quilts. Do you happen to have a listing of scheduled Amish Auctions in this area? Or perhaps an online site that one can go to for reference? I know there are usually some in New Wilmington and Atlantic PA that should be coming up soon. -SATURDAY JUNE 6, 2015 STARTING AT 8:00 AM, 26th Annual Amish Hospital Benefit Auction, At New Wilmington Livestock Auction, 2006 Mercer-New Wilmington Rd. (Route 158), New Wilmington, PA.
-Saturday, June 27, 2015, 8 AM, 23rd Annual Atlantic Benefit Auction, Amish school auction held the fourth Saturday in June. It is usually held on the Mullet’s farm on Atlantic Road, just a short distance east of Atlantic Community Church, Atlantic, PA.
1. Was the applique done by an Amish woman? Note – much applique on quilts sold in Lancaster County is done by Hmong women — they are quicker and their work is exquisite and often finer than Amish applique — it depends on the seamstress. 2. Was the piecing of the top done by an Amish woman? 3. Was the quilting done by an Amish woman? 4. Was the quilting done by one woman or a group? It’s important to remember that the question “Is this an Amish quilt?” is too broad. Some sellers will answer that question by saying “It was quilted by an Amish lady.” The purchaser sometimes assumes from that answer that it’s an Amish made quilt, but the seller hasn’t said that every stitch is done by an Amish lady. That’s why I suggest breaking the questions down into the various parts of the process. Just a personal opinion here, but Amish constructed quilts are not necessarily superior to quilts made by other ladies in the area. I’ve seen both well made and poorly made Amish quilts, and I’ve seen both well made and not so well made quilts made by ladies of other faiths. Each quiltmaker has perfected her skills to a different degree, and I feel good workmanship is more important than religion of the maker or makers. The factory made quilts that Debbie mentioned are to be avoided — they are imported from overseas. Look along the edge to see if a tag/label has been removed. Also look for large quilting stitches and shabbier fabric. Well said, Barb. I agree that we should not consider quilts which non-Amish women work on to necessarily be of low quality. Many Hmong women do beautiful applique work. But if it is important for you to know who made the quilt you want to buy, ask lots of questions. Where would someone find an Amish woman or group to hand quilt a quilt top. I have made a few quilts and I would love to make one and have it quilted by the Amish. Also how do they go about pricing such work? *Check the bulletin boards at local Amish owned fabric shops, many Amish quilters will have a hand written ad for their sewing / quilting. * Check the bulletin board at any of our local Amish grocery shops. If you don’t find one, ask the Amish shop owner where you can post an ad seeking a Quilter. * If you attend an Auction, ask around … There are hundreds of Amish ladies there and I am sure you will find at least one if not a dozen willing to help with your quilting. * Driving through the countryside is a great way to meet Amish ladies selling their wonderful fruits, veggies and jams. When you stop to make your purchase, don’t be shy, ask the Amish lady if she quilts or knows somebody who does. Chances are good, she has a neighbor or church friend / family member who will do so if she herself does not. * Most of all, don’t be shy and don’t be afraid to ask around. As for pricing, hand quilting is priced by the yard of thread. So the quilter will cut the thread into many yard pieces, she will count each yard piece she cut and as she threads and retreads her needle she will make a check on a page with her pencil. When the quilt is finished, she will count and add up all the checks on her page and charge accordingly. The going rate starts at a very fair price of $1.20 per yard. PS, once you find your Amish quilter, make sure you have her sign the corner of the quilt for authenticity. It’s also a kind gesture to tip her for all her hard work. Source: I am not Amish though I am a quilter living in an Amish community and my Amish friends and neighbors do hand quilting.